University of Nottingham > Blogs > The News Room > Physics and Astronomy > Banging the drum for quantum physics! Yes, a professor of physics at the University of Nottingham, has published a new book which provides an ‘entertaining’, ‘enlightening’ and ‘metal-sci’ view into the mysterious and mind bending world of Quantum Physics! Philip Moriarty in the School of Physics and Astronomy, says chugging guitars, choked cymbals, artificial harmonics and mosh pits each have their own parallels in the physics of the ultra-small and these links have not had the much-needed attention they deserve. Quantum Physics – or as Prof Moriarty describes it, the science of the smaller than small – is, he agrees, conceptually very challenging. So, what better way for a physicist to explain the inexplainable than by relating it to his other great passion – heavy metal. 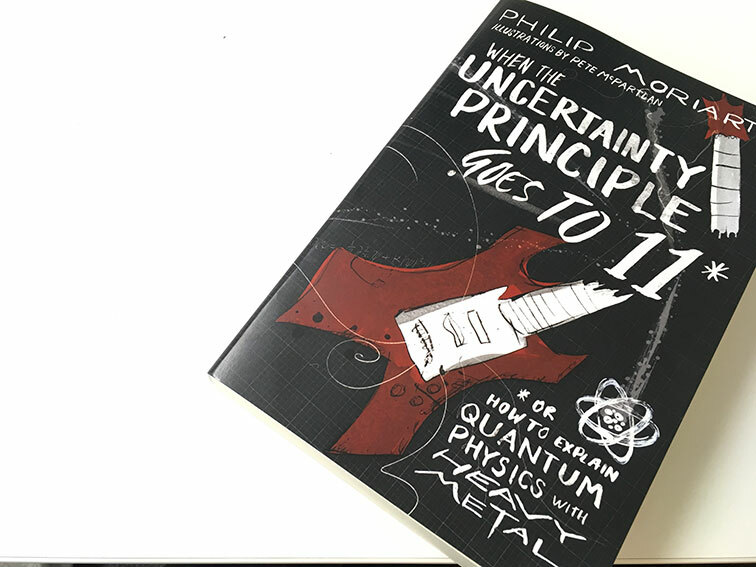 The key motivation for his new book – When the Uncertainty Principle goes to 11 – or How to explain Quantum Physics with Heavy Metal – is to bring the beauty of quantum physics to a wider audience by the medium of metal and he’s done that in this book which is littered with entertaining illustrations by Pete McPartlan. When the Uncertainty Principle goes to 11 – or How to explain Quantum Physics with Heavy Metal – is available on Amazon. “It will bring a new beauty to your favourite songs and arm you with fresh concepts to explain some of the most counter-intuitive of scientific ideas.” David Domminney-Fowler, guitarist with the Australian Pink Floyd Show.